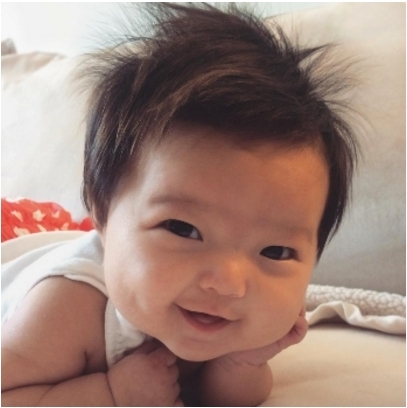 Home > Gerber Newsroom > Press Releases Gerber® Names Newest Winner of Gerber Baby Photo Search 2015! Gerber® Names Newest Winner of Gerber Baby Photo Search 2015! FLORHAM PARK, NJ (Jan. 27, 2016) – Today, early childhood nutrition leader Gerber announced a precious new star and the winning entry of the sixth annual Gerber Baby Photo Search 2015 – baby Isla from Troy, MI. The dimpled seven-month-old was selected as the Grand Prize winning entry from more than 170,000 entries. As the winners, Isla’s parents will receive a $50,000 grand prize, $1,500 in Gerber Childrenswear and the opportunity to be featured in 2016 Gerber ads. Fans will also be able to follow along with Isla’s journey all year long as this year’s Spokesbaby through frequent updates featuring her adventures on Gerber’s Facebook and Instagram pages. The annual Gerber Baby Photo Search was held online at Gerber.com/photosearch, where parents and guardians were invited to enter a photo of their child into the search during the entry period. A panel of judges reviewed the entries to find children from birth to preschool age whose photos displayed expressiveness and consistency with Gerber’s heritage. Since the inception of Photo Search six years ago, Gerber has awarded seven (twins in 2013) other tiny tots the Photo Search crown. Last year’s winner, Grace, was the first baby to be awarded the title of “Spokesbaby” and captivated the hearts of the nation with her smile and charm all year long! In addition to the Grand Prize winner, six winners were selected from each Milestone category – Birth+, Supported Sitter, Sitter, Crawler, Toddler and Preschooler. Milestone winners were determined by the highest number of consumer votes from each category on Gerber.com/photosearch. The six Milestone category winners will each be awarded $3,500, plus $750 in Gerber Childrenswear. Winner photos and information, along with additional information about Photo Search 2015 and Gerber, can be found by visiting Gerber.com. Gerber Childrenswear LLC is a leading socially responsible marketer of children's everyday basic/fashion apparel and related products which it offers under some of the world's trusted brands. Licensed brands include our flagship brand, Gerber®, as well as New Balance®, Jockey® and NFL®. Proprietary brands include Onesies® and Always Baby®. The company sells layette, sleepwear, playwear, activewear, undergarments, accessories, hosiery, bibs/burp cloths, bath and bedding, as well as reusable cloth diapers, to all channels of distribution. For additional information about the company, please visit www.Gerberchildrenswear.com.